La Plata, Frankfurt am Main, März 1996, Specimen einer 10 % Inhaber-Teilschuldverschreibung über 10.000 DM, o. Nr., 29,7 x 21 cm, rosa, braun, lochentwertet, mit dem Wappen der Provinz. 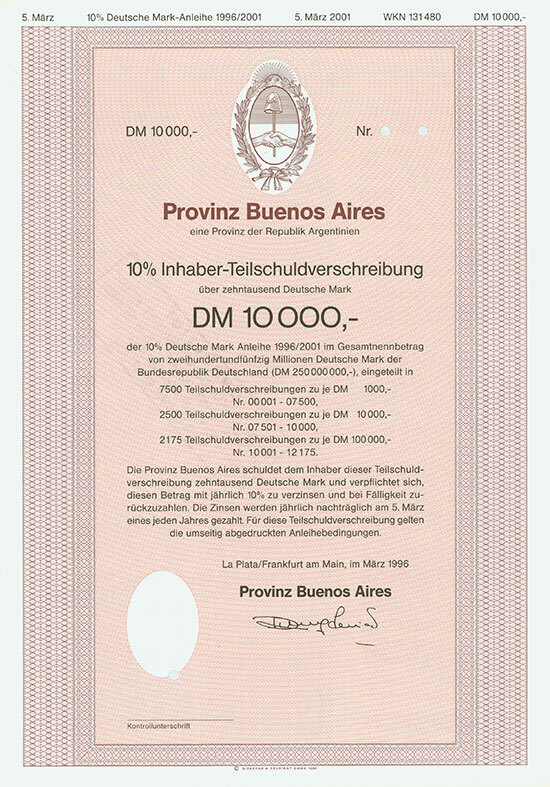 La Plata, Frankfurt on Main, March 1996, Specimen of a 10 % Bond for 10,000 DM, o. Nr., 29.7 x 21 cm, pink, brown, hole cancellation, with coat of arms of the province.